Tsunamis, storm surge, and rip currents can cause mass devastation and/or death. They all originate through combinations of the ocean and weather, but they are very different threats. All of these threats apply to those who are near the coast, on the coast, or in the ocean. This makes these threats very regional, and important to understand if you live in a possibly affected area. Tsunamis: These giant waves cause the most destruction of the three that we examined. Though they are fairly infrequent, they can plow through buildings easily and have an extended range. They can be caused by space weather, earthquakes, and volcanoes. Storm Surge: A temporary rise in sea level can put many buildings (and people for that matter) under water. Storm surge is also far reaching in many areas, since most land near the coast is not that high in elevation. These temporary surges can be caused by severe storms and hurricanes. Rip Currents: These invisible killers claim the most lives per year of all three types of coastal incidents. While it only affects only a few people at a time rather than a whole community, they should not be overlooked as a threat. Those caught in a rip current can easily get pulled out to sea to drown. The threat is reserved for those swimming or wading in the water, but that does not make it any less deadly. The severity of a coastal incident can fall in a wide range. From a mega tsunami to a small rip current, the scope, range, and impact can go from world ending to barely a threat. A mega tsunami could certainly cause the end of the world as we know it. The distance a large tidal wave can travel inland is quite startling, and would catch the majority of the people living in that area off guard. But besides a meteor or super volcano induced tidal wave- the rest of the coastal incident threats are not quite so great. 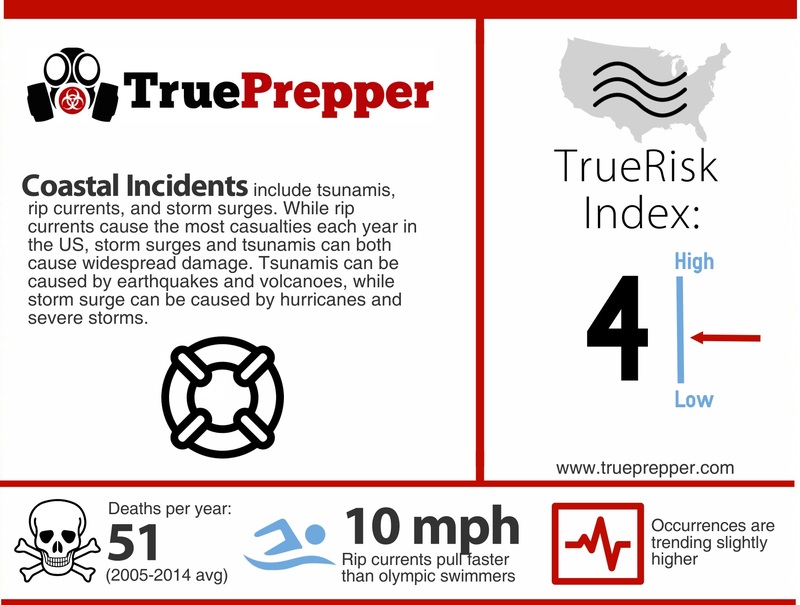 The risk for a coastal incident is relatively high on the TrueRisk scale at a 4. Luckily, this threat is very geographically localized to the coast. Rip currents are extremely isolated, but are a naturally occurring phenomenon that can persist for long periods and easily claim lives. This makes them less severe of an incident, although deadly. Storm surge affects a larger area, but is usually predictable and has plenty of notice since it accompanies large storms. Tsunamis are deadly, affect a large area, and are usually part of a ‘domino effect’ of disasters. The combined threat of these incidents results in a risk level that should be noticed and prepared for if you live in a coastal area. If you live inland, only TEOTWAWKI coastal incidents would pose a threat. The ability to bug out is one of the more important ways to be prepared for a coastal incident. Most severe incidents have warnings ahead of time, so staying informed can definitely give you a leg up on survival. The main components you will need out of the survival kit is the communication supplies. Having these set up to notify you of any coastal incident warning will give you the much needed time to use your bug out bag to escape the area. In the event of a rip current, the survival kit first aid component may be needed. An evacuation plan, fondly known by preppers as a bug out plan, is very important to avoid becoming a casualty. A bug out plan, of course, is more comprehensive than your typical evacuation plan since it covers your end destination, equipment to bring, and a vehicle or plan to get you there. The different coastal events require different actions. Knowing what to do during each of these events can greatly increase your chance of survival. If you are personally caught in a rip current, the most important thing to remember is to relax, locate the shoreline, and swim perpendicular to the shore to escape the current. Trying to fight the current, or swimming with the current will tire you and pull you further from safety. For both tsunamis and storm surge, evacuation is recommended if you receive advanced notice. If you cannot escape in time, it is best to get to higher ground and as far away from the beach as possible. Recovering after the disaster will take some time and a little know how. It varies based on incident, but storm surge and tsunamis are similar where rip currents are different. Storm Surge/Tsunami Recovery: Assuming you evacuated, you will need to wait until the water subsides and the area around your home is safe. Once is it safe to return home, inspect the damage and note anything salvageable. You will want to contact your insurance company, if you have one that covers these events. Rip Current Recovery: Administer first aid and/or CPR to the victim. If you were the victim, regain your breath and try to relax. Make sure authorities and others in the area know of the threat and to avoid the water in the area.